Santa Monica is committed to protecting, preserving and restoring the natural environment. In 1994 the Santa Monica City Council took steps to address sustainability by adopting the Santa Monica Sustainable City Program. The City’s goal is to reduce greenhouse gas (GHG) emissions by 30% below 1990 levels by 2015 for City operations and to reduce emissions 15% below 1990 levels by 2015 for the City as a whole. The Sustainable City Program was initially proposed in 1992 by the City’s Task Force on the Environment to ensure that Santa Monica continues to meet its current needs without compromising the ability of future residents. The City focused its efforts on renewable energy, sustainable procurement, green building, green public transit and green businesses. This includes retrofitting buildings to meet LEED certification, installing solar arrays and taking steps to divert waste from landfills. Following years of implementation, the Santa Monica Sustainable City Program has achieved much success. What Actions Did Santa Monica Take to Build Green and Use Solar Energy? Solar capacity in the city has doubled since the launch of Solar Santa Monica. To date, there are 139 grid connected solar projects in the city representing 926 kilowatts of solar capacity. 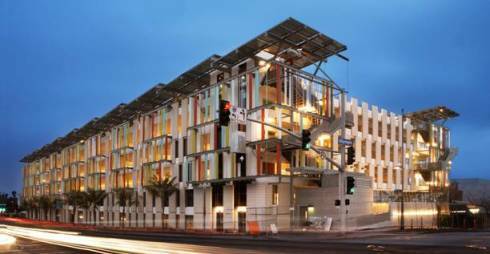 The mixed-use Santa Monica Civic Center Parking Structure is the nation’s first sustainable parking garage. It received Leadership in Energy and Environmental Design (LEED) certification with a project score of 32 points. The 882 parking space structure includes 9,000 square feet of commercial retail space and a solar photovoltaic roof canopy that generates 181 kilowatts of solar electricity. The Natural Resources Defense Council retrofitted their 1920s-built Santa Monica office, achieveing Platinum LEED certification. A 7.5 kilowatt solar array on the building’s roof provides 20% of the building’s electricity needs. What Actions Did Santa Monica Take to Recycle and Cut Waste? The City’s food waste composting program kept more than 1 million pounds of waste from Santa Monica restaurants out of the landfill in 2008. In addition, the Community Waste Diversion Program reduced GHG emissions by 36%. The City is committed to making procurement decisions which minimize negative environmental impacts. While the City’s purchasing structure is fairly decentralized, the City charter requires purchasers to choose the “lowest and most responsible bid,” regardless of the size of their purchases. This sustainable procurement program helps to ‘green’ the City. The City also purchases 100% post-consumer recycled content copy paper for municipal operations. Annually, this saves an estimated 1.2 million gallons of water, 158,000 pounds of CO2 and leaves 1,700 trees standing in the forests. The City of Santa Monica continues its mission to reduce greenhouse gas emissions by 30% below 1990 levels by 2015 for City operations and reduce emissions 15% below 1990 levels by 2015 for the City as a whole.